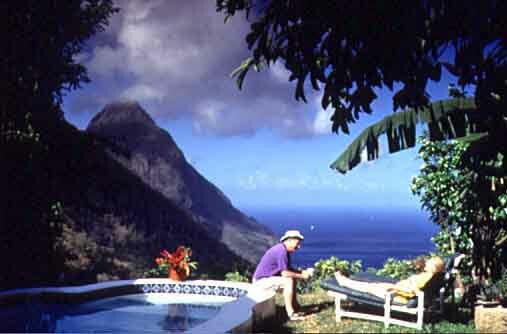 The Ladera Resort is located on the southern end of the beautiful island of St. Lucia. 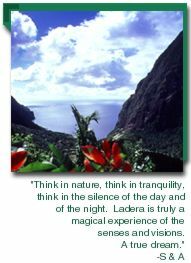 Nestled 1,100 feet up on a sloping hillside overlooking St. Lucia's Piton mountains and the cobalt vastness of the Caribbean sea, Ladera is truly one of the most intimate and romantic escapes anyone could ever wish for, or even imagine. 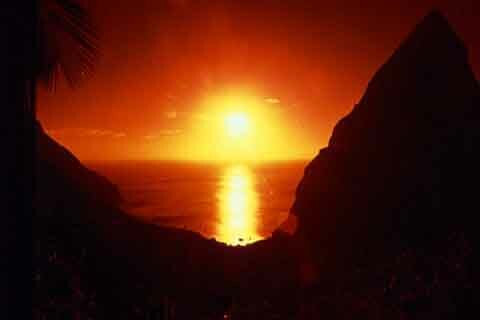 Called one of the Caribbean's "10 Best Romantic Spots" by Caribbean Travel and Life. Ladera offers unique, open air design accommodations with breathtaking views, fine dining and an experience to remember for a lifetime. All the luxuries you can expect, with the majestic views, fine dining and spectacular living quarters are all gathered at Ladera. Visit our family of Pearl Hotels for more exotic hideaways.